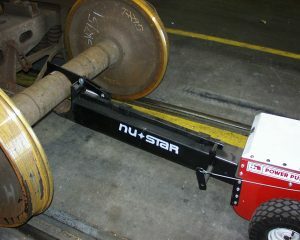 Power Pusher’s Railroad Attachment™ is the perfect rail mover for pulling trucks out from under railcars. The connection is positive locking and also lined with plastic to eliminate steel on steel contact while ensuring the truck doesn’t slip away. The Power Pusher Railroad Attachment not only eliminates the need to go under the car body but it also increases productivity by reducing strain-related injuries. Several length options are available to remove the hardest to reach trucks under rail cars.